Picture above shows PGM James Curtis presenting the Charter issued to Springtown Lodge #75 to the then Noble Grand Jerry McGee (now PGM). James instituted Springtown Lodge #75 while he served as the I.O.O.F. 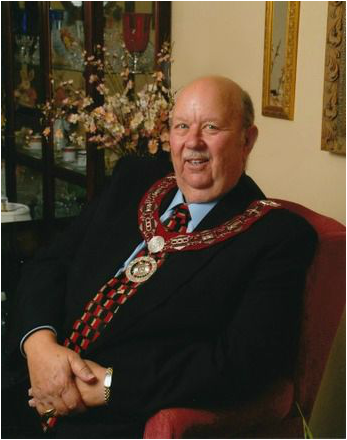 Grand Master during 2005. Texas loves Past Grand Masters that are down to earth. slideshow below may be paused and moved with arrows. .
TO THE GRAND LODGE I.O.O.F. OF TEXAS: To all members of this great Fraternity of the Independent Order of Odd Fellows of Texas, I have been deeply honored to serve you as Grand Master. Thanks to all who have made this possible for me. A special thanks to Nancy for all that you have done for me. Without you to guide me through this, I would not have been able to do this job. To Darline and Christy, who have also been of great help to me when I needed you. Each one of you came through for me and I will always be grateful to you. I also want to thank Deputy Grand Master Frank Ford, Grand Secretary E. Dixon Toney, and Grand Treasurer Bob Kirby. These men were faithful in their attendance at the meetings of the Executive Committee all year. They have been outstanding in their commitment to this Order. Now I want to thank my wife, Barbara, for her help and understanding. There would be times when she would come home to an empty house and would not know where I was. Brother Jack Tatum and E. Dixon Toney would have me going to a lodge that needed our help to put on degree work. She never said a word other than "I figured you were taking care of business for the Order." When we would get a call from a lodge needing our help, these two men were always ready to go. Brother Bill McMillin was also one who would go with us if it were possible for him to go. Brother Bill delivers meals on wheels and sometimes he could not get anyone to take his place. On December 13", Frank and Rosa Ford, E. Dixon Toney, and I traveled to Texas City Lodge No. 858 to help revive the lodge. 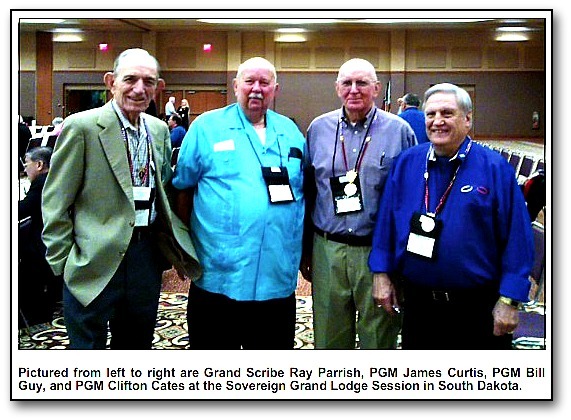 Four members of Pasadena Lodge, Jerry Don Curtis, Brent Galloway, Jerry Galloway, and Walter Brown, joined the lodge as Associate members in an effort to help save the lodge. The members at Texas City are now excited about the future of their lodge. I had the misfortune of having to demise two lodges this past year. They were Goose Creek Lodge No. 960 in Baytown and Circle Lodge No. 176 in Lubbock. That is the sad side of being Grand Master, but I took an oath to fulfill my duty and I was not going to pass it on down to Brother Frank to have it on his shoulders to worry about. On August 18, 2005, I demised the Goose Creek Lodge No. 960. I tried three times to meet with the members of that lodge and three times I was refused. On the third attempt, a certified letter was sent to every member of the lodge to inform them I would be there on their regular meeting night and that Grand Secretary E. Dixon Toney would be with me. I informed them to have their books on hand as we would be checking them out. I received a letter from the Lodge Deputy saying they would not meet us there. I sent out another letter to inform them that we would be there as the letter stated and if they wanted to save their lodge, to please meet us there. Not one member cared enough about their lodge to meet us there. Therefore, I decided to demise the lodge. I did not want to do this, but they left me no other choice but to do what I did. Now, on the good side, I was very fortunate to institute a new lodge in Springtown, thanks to the hard work of Brother Danny Wood. I have also put into place various committees in different parts of Texas to have golf tournaments for the various I.O.O.F. programs. I feel like this will help our Order out tremendously and get our name out to more people than anything that we have going at this time. All monies that are taken in from these tournaments will be sent to the Grand Lodge Office and put into a special fund to send students on this trip. Therefore, it will not be coming from lodges as there are only a few that can afford to send a student. If everyone who can will get behind this cause, it will succeed. If the members who want to help can't due to the fact the tournament is too far away, then you can send a donation to the cause. That way, every member in this Order will have the chance to participate. If we succeed in this goal, we will get the students and their parents, their grandparents, brothers, sisters, and their friends and neighbors knowing about us. We will go into the schools and have the students who want to go write an essay and the Grand Lodge will pick from them. When the students go home and talk to their parents, they are going to check us out. That is what we want them to do. I would like for all of the members who have had a part in raising funds for this project to know how much I appreciate you. Without your help this will not get off the ground. This year we have in place a committee to find out if it is feasible to build a new retirement home. We have gotten that committee working towards that goal. I have been to all lodges in this jurisdiction and have thoroughly enjoyed it all. The F. L. & T. is alive and well in this Order, the food has really been good also. I said that I would work closely with the Membership and Expansion Committees for the good of the Order and I have kept my promise to you, the members. We have traveled down these highways to promote Odd Fellows and to try to get new members. We have worked really hard to build up this Order and have brought in quite a few new members. I want you to know that I did not do this by myself -without you, it could not be done. Thank you for allowing me the privilege of being your Grand Master. I will hold the memories of this year in my heart for as long as I live. I will remember the kindness that you have shown to Barbara and me in our visits with you, and I will cherish it always. 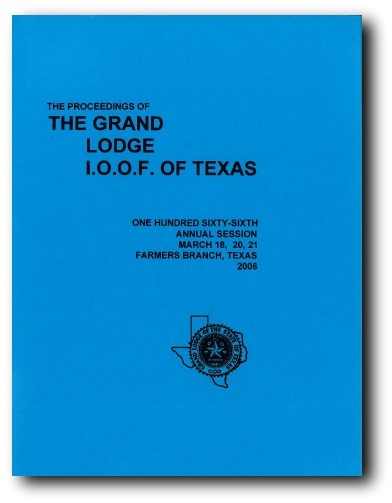 I hope to see you at the Grand Lodge session in Farmers Branch this coming March. God be with you and your family for always. Well, I will back on out and truck on down the highway.